Have You Heard Of Bissoumine? – Come In And Find Out! Bissoumine is a relatively new french brand offering seven fragrances created by two perfumers, Kitty Shpirer and Patrice Martin. Bissoumine means perfume in ancient Aramaic. Read more about the back story of the brand here. The Bissoumine website is very informative, and the best thing – they offer a sample set of their first six perfumes for 16€ including shipping. Un Ange Passe, the latest addition to the line, is not yet available as a sample, as far as I know. Well, for that sum my curiosity could be assuaged. A week later a neat package arrived containing the samples in a cute, little box. The design is nice, each perfume has its own unique label. A small point of contention: these labels are stickers that don’t stick to the sample vials very well. Mine arrived with two stickers stuck together and completely lose in the package, off the vials. I had no way of ascertaining which label sticker belonged to which vial. It became clear later upon smelling them, but I still wished the vials were a bit more indelibly marked. I came to Bissoumine with no expectations whatsoever and my impressions of the six perfumes are mixed, there are some I like, some I don’t and some that just leave me unaffected. Read on for my preliminary impressions of the different perfumes. Soufflee Sauvage: This is the most interesting and unique of the six sents I tried. Upon the initial spray I smell coffee, not freshly brewed, but coffee grounds. They give way to a mix of hay, peach, dried fruit, and something dry and raspy, a gritty texture that is hard to put into words, but makes this perfumes very interesting indeed. It is described as having a carnal and insistent character. I don’t know about carnal here, but I agree with insistent, it is a scent that sticks with you and piques your curiosity. The site lists the notes for this fragrance as follows: wildflowers, white peach, mandarine, myrrh and white musk. Rivages de Mediteranée: This is a somewhat unexiting orange blossom, jasmine fragrance that doesn’t offer anything groundbreakingly new. But it is a solid and wearable, which for me means rather subdued, white flower fragrance. The notes are orange, mandarine, spices, orange blossom, jasmine and cedar wood. Temps de Réves: Notes include cinnamon, pepper,Turkish rose, vanilla, sandal wood and cedar. This one is lovely. I would wear this, should I receive a bottle from somewhere, but I wouldn’t seek it out especially, since it is reminicent of Idylle, Narciso Rodriguez for Her and SJP Lovely . An oriental rose on the other end of the spectrum from Malle’s Portrait of a Lady. Nuit des Iles: “A feminine perfume, refined and delicate, giving an overwhelming sensation of evasion.” That is what the website has to say about Nuit des Iles, and I absolutely agree, the sensation of evasion is there all right. This was truly disappointing. Starting out nice with a bright citrus top note, I could almost see the lovely and fresh frangipane flowers coming in before the door gets thrown shut in my face and all that is left is a thin plastic smell that is best evaded as well, but fades on its own in a few minutes, and I am left stumped and wondering as to where in the world the fragrance went. Notes include (or exclude as I cannot for the life of me find them) lemon, bergamot, frangipane, vanilla, cinnamon, Tonka beans and musk. Soir Ensoleillé: This is a warm, slightly boozy, raspberry-plummy vanilla scent, with spices to make it interesting and a good dose of heliotrope. While most of the others are suitable for men and women this one is decidedly feminine. It reminds me of Guerlain Spiritueuse Double Vanille or Hermessence Ambre Narguilé. 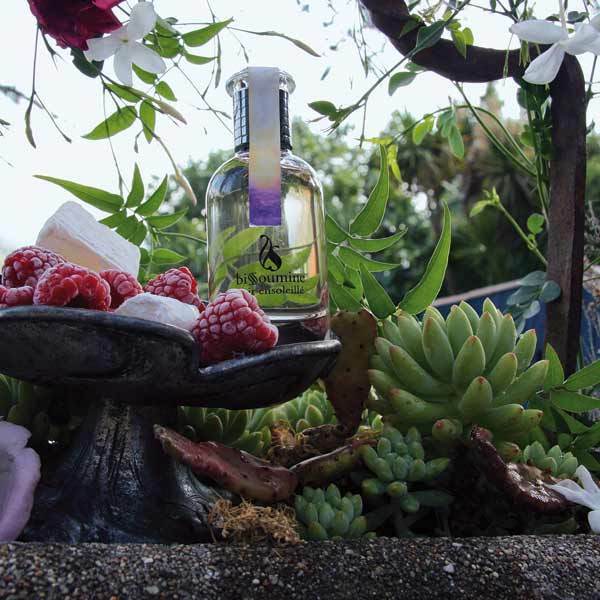 Notes include: Indian jasmine, rose, heliotrope, raspberry, pepper, musk, amber, sandalwood and vanilla. A good gourmand scent that walks the fine line between inedible and edible, not quite settling into the one or the other category. I like my gourmands inedible, because I am no cake. Ultimately I think Bissoumine is a nice line to encounter but contains no absolute must-haves for me. For a brand that wants to position itself as niche, the fragrances are not “niche” enough, in my opinion. But they are nice enough. There is one disappointment in the bunch (Nuit des Iles) but other than that, the remaining five perfumes are solid, wearable and likeable creations. I guess, I had hoped for at least one earth shattering or truly unique perfume. Souffle Sauvage qualifies as extremely interesting and different from the others as well as from many scents. It is easy finding smell-alikes for the others, not so for Souffle, but while I appreciate its unique character, it is not exactly my cup of tea. My favorites are Soir Ensoleillé and Temps de Reves, and though I can find similar scents in my closet, I am charmed by them. Since they are excellent versions of the industry/mass-market-beloved fruity-floral, I guess they will be the line’s best-seller. 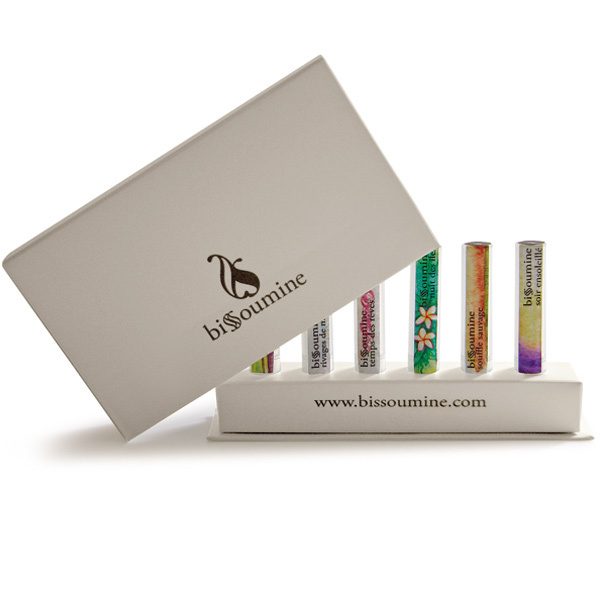 I imagine Bissoumine perfumes make great gifts, especially for non-perfumistas. Each scent comes in Eau de Toilette strength and wears for about three to four hours on me. 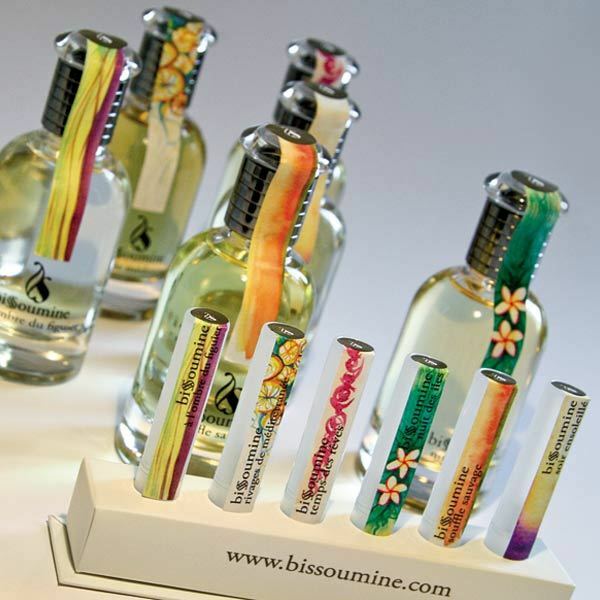 Bissoumine perfumes are available from their website as well as several points of sale in France, Israel and the UK. Image source: all images courtesy of bissoumine.com, thank you! This entry was posted in Amber, Bissoumine, Citrus, Floral, Fragrance Reviews, Gourmand, Musk, Oriental and tagged Bissoumine, Fragrance, Perfume, Review. Bookmark the permalink. 13 Responses to Have You Heard Of Bissoumine? – Come In And Find Out! You’re so right B; a niche firm really does need to do niche fragrances to give you the impetus to seek them out and (usually) pay a premium. “the sensation of evasion is there all right. This was truly disappointing” Oh B, that really made me laugh! Yeah, the heliotrope, sorry that this is a no-go for you. But I think you would enjoy Temps de Reves, since you like those kind of rose scents as do I (if I remember rightly). Souffle Sauvage is really the only more unconventional perfume. I am not saying everything must be cutting edge or experimental or strange-smelling to be niche, but there has to be something a bit more interesting and attention-catching and -keeping. Soufflee Sauvage sounds like a winner for me (despite the fact I loathe white musk), and I love cloves so A l’Ombre du Figuier might be worth a try too, even though I generally steer clear of fig fragrances because they tend to go “coconutty” on me. The bottles and packaging are lovely. These would make beautiful gifts for a budding perfume lover. Thank you for bring this new line to my attention! I don’t think you are going to have a problem white musk being prominent in Soufflee Sauvage. If you love cloves and coconut-free figs, L’ombre could indeed be a winner for you! I am glad that you’ve done the investigation, I was not very tempted. 🙂 Souffle Sauvage sounds interesting to me too. Dear Birgit, I recently came across this while researching some Indie lines, and even though I’m two years late I wanted to say how much I admire your integrity in reviewing an indie line to the same standards as other lines. I have read absurd levels of praise for quite mediocre offerings, just because the company was a small independent one. Their products are being sold to us on the open market, often at quite high prices, and need to be judged as honestly as other products on the open market.